The U.S. Coast Guard’s mission of keeping the seas safe will soon get an additional boost from space with two polar satellites. The two satellites, called “cube satellites” or “cubesats” for their small size of about 60 square centimeters, or a little under 2 feet, will be part of a payload on a SpaceX Falcon 9 rocket scheduled to launch from Vandenberg Air Force Base in California Nov. 28. Although the Coast Guard has used satellite technology for years, these two are the first to be entirely dedicated to a Coast Guard mission. The initiative is part of the U.S. Homeland Security’s Polar Scout program, which aims to increase technical resources in the Arctic to detect emergency position indicating radio beacons, or EPIRBs, sent from mariners in distress in that region. The project will also be a test to explore the effectiveness of using the cubesats, which are less expensive than other forms of technology, for these and other missions. The service will also gain two ground stations to monitor and control the satellites as they orbit the planet over the poles every 100 minutes or so. One ground station has already been completed in Fairbanks, Alaska. Another is planned for construction before the end of the year atop Smith Hall at the U.S. Coast Guard Academy in New London, Conn. 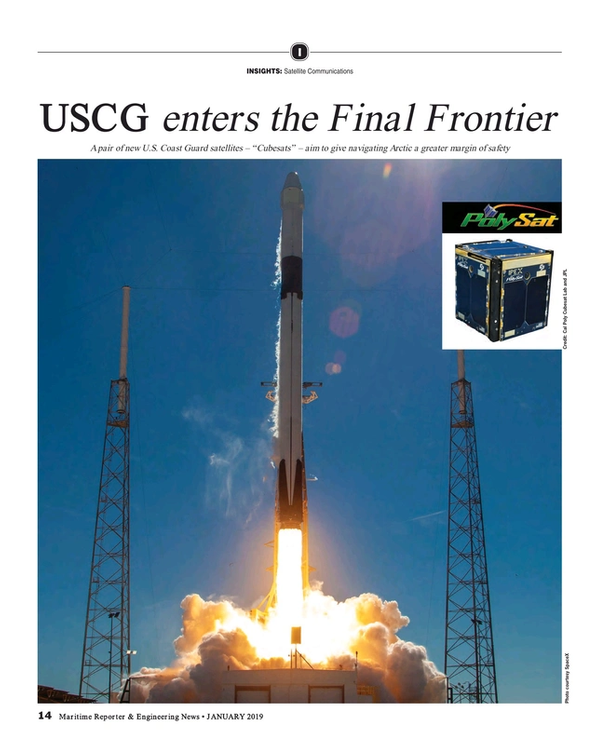 The increasing sophistication of technology, along with the ever-shrinking size of electronics, has made it possible for cubesats to do the job that once was performed by much larger and much more expensive satellites, said U.S. Coast Guard LCRD Grant Wyman. He is the project manager for the initiative at the U.S. Coast Guard Research and Development Center in New London, Conn.
“It’s really expensive to build, launch and maintain a satellite, but the technology advancements that have occurred in recent years have begun to reduce those costs,” said Wyman. He explained that the two cubesats, named Yukon and Kodiak, would orbit in “low Earth orbit” of between 690 and 1000 kilometers, or about 428 to 621 miles. The Arctic is a high-priority area for the Coast Guard, Wyman said, as commercial shipping and even cruise traffic increases in previously inaccessible areas as the ice melts with climate change. Yet the area is still an extreme environment even in the warmer months, with harsh weather, cold temperatures, and emergent areas of navigation. The diminutive satellites will likely have some company as they are launched into orbit; the Spaceflight rocket that will launch the cubesats for the Coast Guard will have a payload of more than 70 other satellites for 35 different organizations. The mission has thus been dubbed the SmallSat Express for the variety and number of spacecraft involved, the most launched from any U.S. spaceship. This high-tech form of ridesharing has a positive upside: the more organizations and governments launching on the same rocket, the more the venture can potentially lower the cost of entry into space for all. The reduced cost of the cubesats – and the construction of a ground station at the Coast Guard Academy – will also have an impact across the board on the education of Coast Guard cadets, for which the Academy has been preparing for the last five years, said Dr. Lorraine Allen, associate professor of physics at the Academy. “We’ve rolled out a new curriculum for the marine and environmental sciences major. It fits in perfectly,” she said. Data from the cubesats will also be used for independent study. “Our students can form ideas for projects, whether it is a mission gap or something they are curious about.” For example, the Academy course on remote sensing, required for two majors, will use the satellite data as it detects mariners in distress. The physics and engineering students will be able to design proposed new cubesats; other cadets will help provide 24/7 coverage to read the data as it comes in.. “The students will use the information to ask ‘What are the gaps? How can we supplement the data we need with what we have?,” said Brooke S. Stutzman, physics section chief at the Academy. The launch of the cubesats and building of a ground station at the coincides with the Academy’s periodic review and revisions of courses to assure that the education next generation of Coast Guard officers stays on the cutting edge, said Stutzman. Over a 30-year journalism career, Maura Casey worked as an editor and opinion writer for four newspapers, including The Hartford Courant and The New York Times. She has won 45 national and regional awards for journalism, including a shared Pulitzer Prize for reporting, Scripps Howard’s Walker Stone Award for Outstanding Editorial Writing, and the Yankee Quill Award based on lifetime achievement in journalism. She has been a staff officer for the U.S. Coast Guard Auxiliary for 12 years, and owns a Connecticut communications firm, CaseyInk, LLC.